Shakthi Electrical Control(formerly Shakthi Engineers) is an emerging identity in the Power Quality Equipment manufacturer circles in India. Our endless product list includes Servo voltage stabilizers,Isolation Transformers,Ultra Isolation Transformers,AC drivers,energy savers,APFC Panels,Constant Voltage Transformers, Phase converters,Harmonic Filters,Electro Platinmg Rectifiers,Special Purpose Transformers under “Shakthi Brand”. Our Manufacturing facilities are equipped with modern machinery & Tools with High Quality work force which ensure flawless workmanship which is the root cause of high quality products. Our multiple stage in Process,Inspection and final Inspection procedures, part our quality management system is the key to the Immense Quality of our products. We have been awarded with an ISO 9001:2008 Certification from JAS-ANZ. All our products are designed for highest priority for us and we pledge to provide the necessary service back-up on time whenever needed. Our R&D team is always keep on developinginnovative and creative products that are practical & conserving resources and benefitting our customers as well our Nations's econoomy. We have strong customer base across India & Exporting our Equipments to various countries like South Africa, Angola, Zambia, Ghana, jordan, Iraq, UAE, Tanzania, Uganda, Kenya, nigeria, congo, Afghanistan, Nepal & Bangladesh etc. We have complete marketing offices/Franchise aross India and company Agents at Dubai, Saudi Arabia, tanzania, Kenya, Ghana. Sakthi aims to be a prominent global player and a national leader in the field of industrial Servo voltage stabilizers,Power Supply and Distribution, promating the cause of energy saving through constant innovation and customization of products and customization of products and introduction of value added solutions for its honoured customers.It is getting set to becomae a one stop shop for Total Power Solutions and other allied producs scaling newer height of technology,setting quality benchmarks for all its products and services and ensuring satisfaction to all its customers. Static (Strength) and Dynamic (Growth) Performence. Error prevention instead of error corrections. 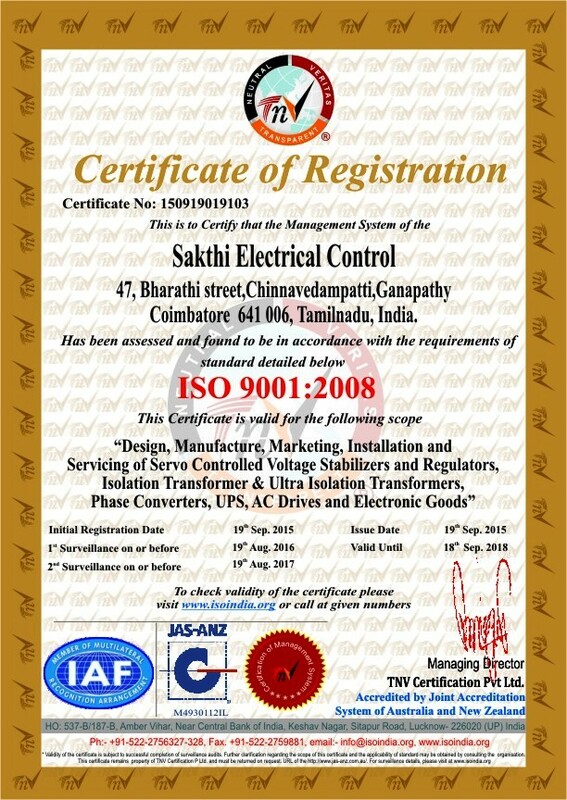 We at Sakthi Electrical Control take the pleasure to introduce ourselves as the pioneers in the field of power conditioning serving the industry by manufacturing and exporting products like Voltage Stabilizer, Isolation Transformers, Rectifier, Converters, Online UPS, APFC, LT Panel Boards and Industrial Automation.